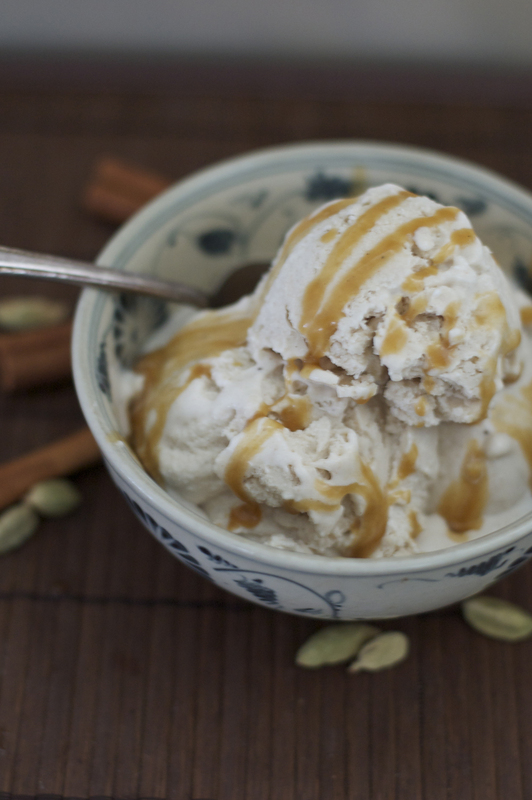 This ice cream can be enjoyed by anyone, but it certainly is a boon to the dairy-free person. Besides butter, dairy isn’t an everyday occurrence in our household as most of us have happier digestive systems without it. I went through a grieving process at first when we took out dairy. But the sadness didn’t last once I learned how to put coconut oil, coconut milk, and coconut cream to good use. Coconut truly is a gift to everyone, and a special one to those who can no longer have dairy. I think that ice cream is one of the foods that all of us should be able to enjoy at least sometimes. Whether it’s a dairy-free recipe like this one, or Jenny’s Vanilla and Fresh Mint Ice Cream, Really Raw Ice Cream with Honey and Berries, or a daring olive oil ice cream – we all should be able to revel in a lovely treat of ice cream. 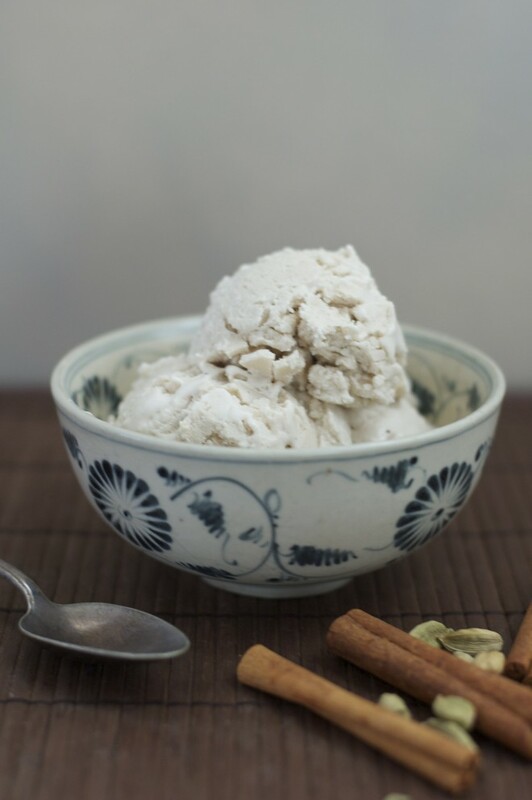 Because I adore spices, this coconut milk ice cream version is definitely one of my favorites. But my seven-year-old and three-year-old still love Vanilla, Chocolate, and Cookie Dough Coconut Ice Cream a little more than mommy’s favorite. I don’t mind, as they complain less if their mother gets an extra scoop of this recipe. Because I make the vast majority of our food at home, I don’t mind using the full-fat canned coconut milk rather than homemade. It makes this recipe incredibly easy and simple to throw together. I recommend Native Forest’s full-fat coconut milk. However, if you’d like to make it with Jenny’s homemade coconut milk (or this one made with coconut flakes), just be aware that your ice cream will turn brick hard if frozen too long, so plan to enjoy it right out of the ice cream maker. Speaking of hard ice cream, I notice that when I keep my homemade ice cream in my deep freezer it does get harder and I need to let it sit on the counter for about 15 minutes before scooping. But when kept in the small freezer above my refrigerator – which isn’t as cold – it is perfectly scoop-able straight away. This ice cream is lovely served solo, but I also enjoyed it with a homemade and naturally sweetened caramel sauce. Next time I am also thinking of trying it with my bittersweet chocolate sauce, or making it into a banana sundae with both sauces and coconut whipped cream available. Now that’s a party! But I am getting ahead of myself. Let’s go to this simple recipe. I hope you enjoy it as much as I do! ½ cup of pure maple syrup (I prefer grade B - available here) or a combination of maple syrup and raw honey – raw honey is sweeter, so a version made with ¼ cup of each still has the maple flavor, and is also sweeter from the honey. This post contains affiliate links. When you make a purchase through the links above, a portion of your purchase will help to support the continued maintenance and development of this site. Hi. Looks wonderful! Can’t wait! Any recommendations on a sleek, home kitchen ice cream maker? I purchased one a few years ago and it was a dud. I use two that both work great and I make ice cream every week for my three boys myself and my husband. Both are made by Quisinart. At this link you can see then at amazon: http://www.amazon.com/s/ref=nb_sb_ss_i_0_25?url=search-alias%3Daps&field-keywords=cuisinart+ice+cream+maker&sprefix=cuisinart+Ice+cream+maker%2Caps%2C798. I own the silver 2 quart one and the white one with the removable lid. I recommend an extra freezer tub as it often takes a full 12-24 hours to refreeze one. Good luck! Great! Thanks Sarah. Will check these out. that’s the one I have too and would recommend it. OK, this recipe put me over the edge into finally buying an ice cream maker. My oldest child prefers dairy, but I think we all do a little better with the coconut milk. I think I’m going to try this half coconut, half dairy! i’m gonna try this with a little ginger too… sounds delicous!! Sounds great but not healthy for heart patients. Oh well. Actually, coconut products are heart healthy! They are In a category of fats called MCFA’s, or medium chain fatty acids. They are immediately converted by your liver into energy rather than being converted to fat. Coconut oil is easy on the digestive system and does not produce insulin spikes in your bloodstream. Coconut oil also helps to increase metabolism which helps in weight management. If you want more info, check out Dr Mercola’s website. , and enjoy this delicious ice cream ! We’re on the GAPS diet, and I was craving something sweet and satisfying tonight. I GAPS-ed this by using honey as the only sweetener. I only blended it (too cold to eat ice cream tonight), and it was delicious. Cravings are gone, too! I think I might add ginger next time… seems like it will be a little more chai-like that way. I just made it and it is delicious. I didn’t have coconut milk so I used half each of coconut cream and water. I would’ve liked it a bit creamier, so I’ll do all coconut cream next time. Wonderful recipe. My 4 year old requested mint ice cream so I deleted the spices you had listed (and forgot the salt) then added 3/4 teaspoon of peppermint extract. I did 1/4 cup maple & 1/4 honey combo. And ran it about 30 mins in our ice cream maker. Then I mixed in 1/4 cup of enjoy life mini chips. Huge hit!!! Will use this as a base and also plan to make the chai recipe next time. Thanks!! I am looking forward to trying this tonight with vanilla! Thank you for the easy and simple recipe. Sounds delicious. Will try this soon. For me, a timely post as tomorrow I am making Chai Coconut Panna Cotta. I just made an ice cream base in the blender and the coconut milk curdled for me as well. I tried putting it in the Nutri-Bullet but to no avail. Not sure what to think! I cannot have honey or maple syrup. Is it possible to use maple extract? Would I need something to replace the lack of liquid from not using maple syrup or honey? is it possible to omit the sweetener from this? or would it mess with the texture too much? I don’t have an ice cream maker (a problem which I will someday remedy…), but this sounded so delicious I had to make it somehow! So I decided to make popsicles instead. I just followed the recipe as is, poured the mixture into moulds, stuck them into the freezer overnight and they turned out great! Delicious and slightly creamy thanks to the coconut milk – I will definitely be making these again. i made this adding 1/8 teaspoon ginger and subbing 3/4 cup peeled medjool dates for the maple syrup. it’s fantastic! Is it possible to substitute maple syrup/honey with Xylitol or Swerve? I’m insulin resistant so I can’t do honey or maple syrup. sure.. you can do that.. it just won’t be paleo anymore. I would add a small amount and taste before you freeze. I am sugar free; for me that includes honey, maple, molasses, fake sweeteners, any type of granulated sugats. But I do use pureed dates or pureed dried apricots with my banana “ice cream” to help satisfy sweet cravings. Would I be able to use the pureed dried fruit instead of the honey and syrup? I just made this recipe today and it did not thicken as dairy recipes usually do in my ice cream maker. Does anyone have any thoughts? I just put it in a container and in my freezer hoping that it will turn out just fine once it’s solid. This is my first time making a non-dairy ice cream. Just wanted to say that I love lots of your recipes and this one sounds gorgeous. I am on a restricted diet as I’m recovering from illness and am always on the look out for more healthy treats, this fits the job so thank you. I have your book too and love it. I made this in my ice cream maker but it never got the icecream creamy texture, it was icy, wondering what I did wrong ? I first blended everything in my Vitamix then poured into the IC maker than froze it. When I took it out I had to break it up because it was hard as a rock…….. suggestions please? Caramel over this ice cream would be amazing. BTW, home made caramel is easy to make and if you add a tablespoon of WHITE MISO to it at the end, it’s the most delicious ‘salted caramel’ on the planet. Just thought I’d share that. 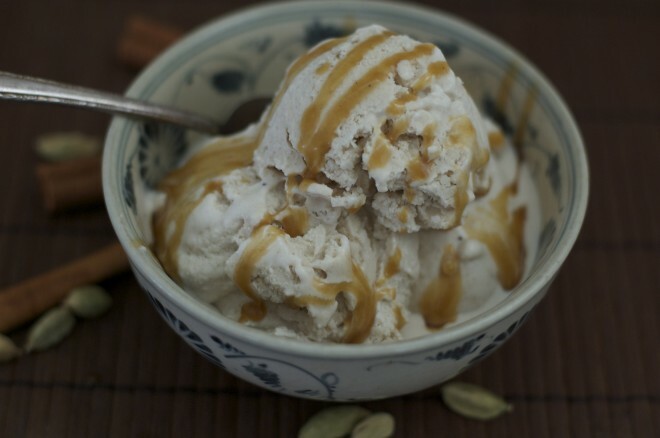 Which form of cardamom did you use in this recipe? Mountain Rose carries essential oil, pods and hulled cardamom. I would think a powder from the hulled seeds would be the preferred choice here, but many people grind the entire pod, which would lessen the cardamom flavor. Hello Jenny, thank you for sharing this recipe. Ice cream is delicious! Very easy to make. I used half maple syrup and raw honey.